You don’t want to be greeted by tins of paint or rolls of soaking paper when all you want is a long hot soak or a good meal after a day at work. When you’re planning a new kitchen and bathroom, you need to be in and out in a flash to resume regular order and that’s why you need Superfresco Easy. Our gorgeous range of non-woven paper boasts sophisticated designs with a practical application method. Instead of cutting your paper and waiting for each sheet to soak, with Superfresco Easy you simply apply the adhesive directly on to your walls, line up your paper and go! It’s time to abandon the traditional wallpapering method and keep things simple. Revamp both your kitchen and bathroom in a day with our stunning range of easy-to-apply wallpaper. Why not take a closer look at the collection? 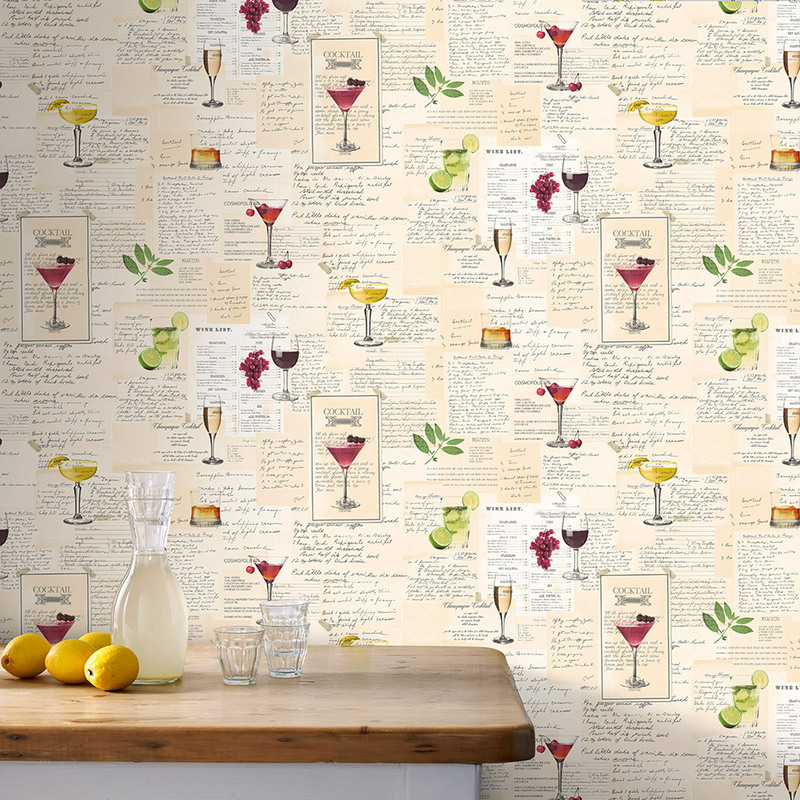 Our cocktails multi-coloured wallpaper is a fantastic way to revamp the kitchen in an afternoon. This sophisticated design sets the mood for parties and events, or maybe just a special dinner for you and your family. With hints of colour dotted across your walls, you could even incorporate the blips of yellow, green and pink into your cutlery and crockery to carry the theme throughout your kitchen. For something a little more humble, our New Brick Grey wallpaper design is the perfect way to recreate a quaint country kitchen. The gorgeous shades of grey displayed on this pattern give off a true-to-life look that will certainly impress your guests. 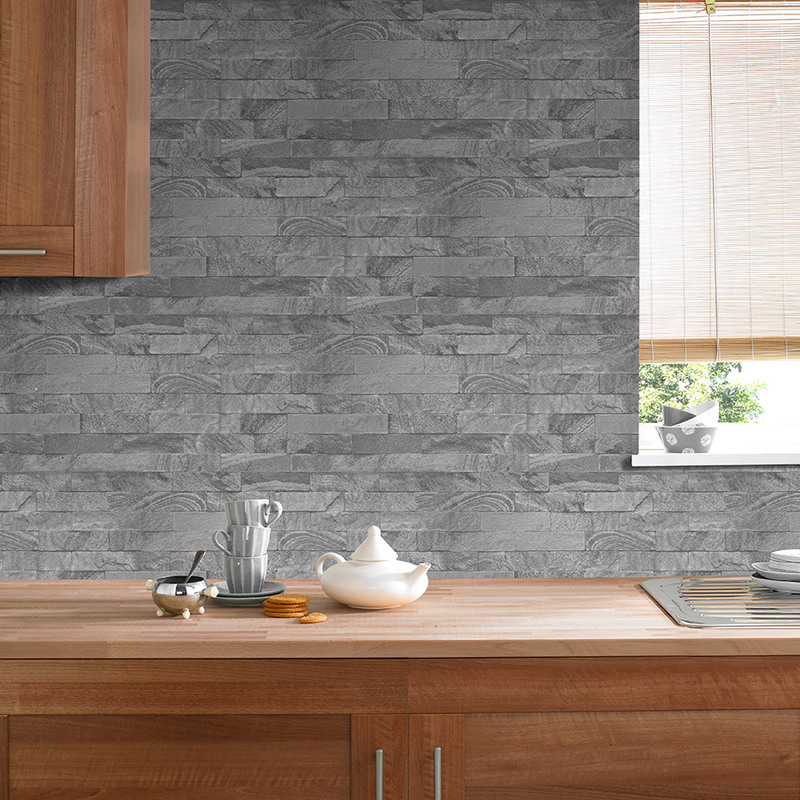 With wallpaper that looks just like real tiles, why would you ever need to meticulously line up slate tiles? Using our super speedy method, you’ll have the same look with less time spent messing up your entire kitchen! Its washable finish makes it a great choice for kitchens owned by enthusiastic chefs in training or little hands that love to be involved with the dinner prep. Or perhaps you’re looking for something a little more contemporary? 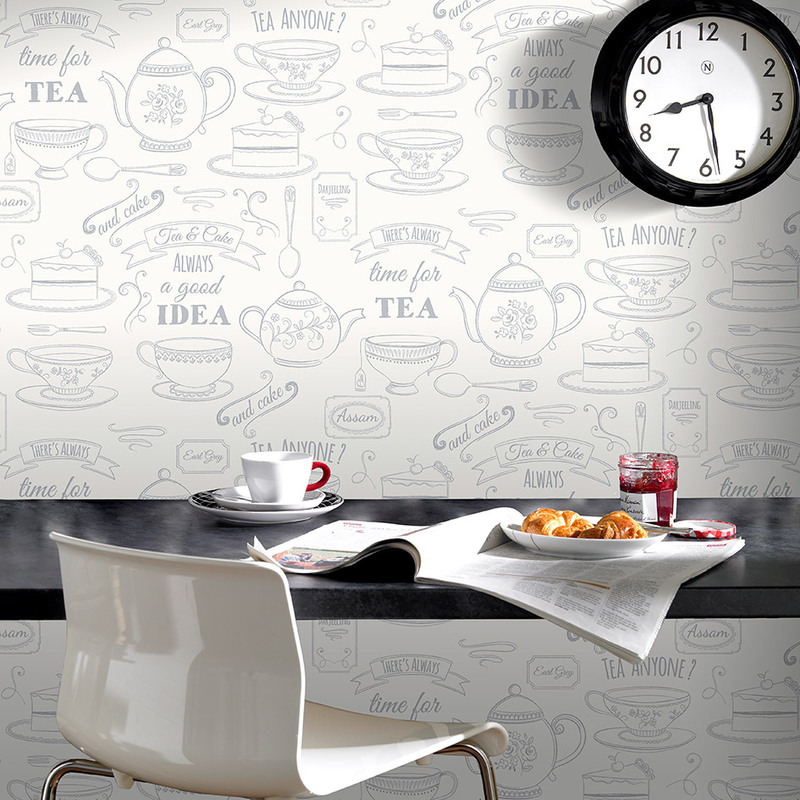 Our typography wallpaper makes a great choice for kitchens that need a more modern finish. Our Afternoon Tea wallpaper in particular looks fantastic in large open-plan kitchens, providing a white backdrop that bounces light around the room. A quirky twist on the traditional kitchen look, this creative motif brings a sense of homeliness to your kitchen. We also have a contrasting typographic wallpaper too! 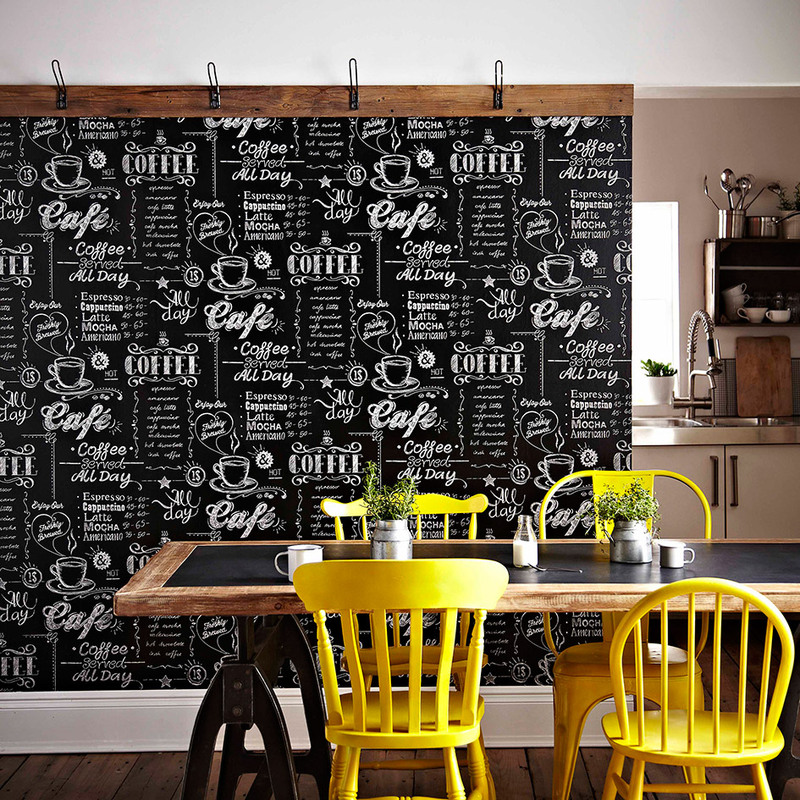 Our Coffee Shop black/white wallpaper really gives your home that chic barista vibe. Coating your room in coffee lover quotes, this wallpaper brings a charming touch to your room. You’ll be done so fast with this DIY project you’ll be kicking back with a cuppa in no time! 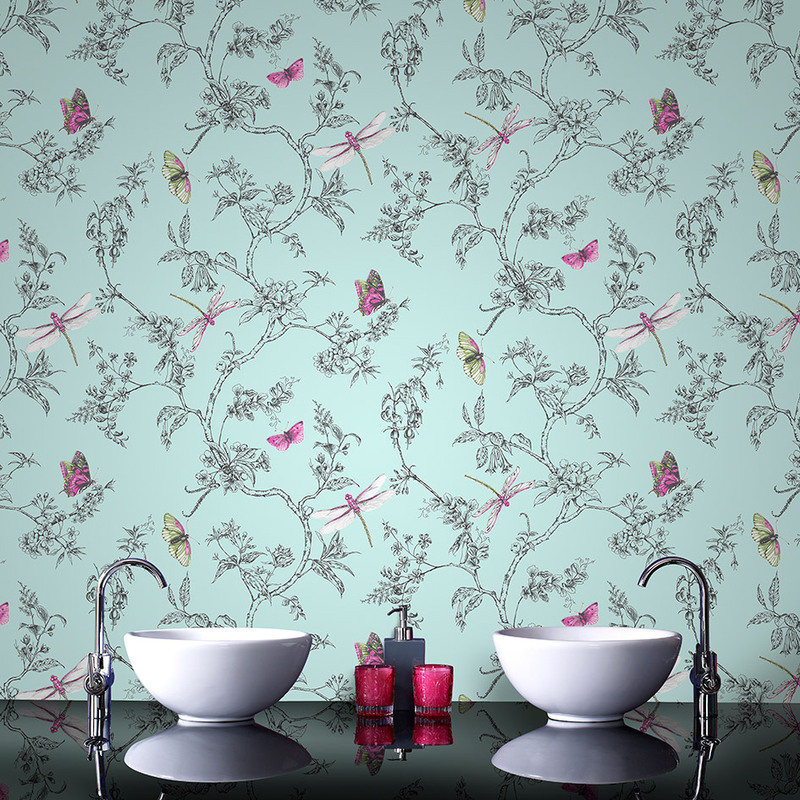 For bathrooms, our stunning Nature Trail Duck Egg wallpaper adds an exotic twist. Pamper yourself with this pastel blue tone that transforms your bathroom into a chic salon. With just a flicker of pink and green from fluttering butterflies and dragonflies that swoop across the design, this gorgeous backdrop gives speedy style to your home in a matter of hours. Another of our stunning tile-effect wallpaper designs, our Rimini Tile Grey wallpaper gives your bathroom all of the wonder of a freshly-tiled surface, without the time-consuming DIY project. 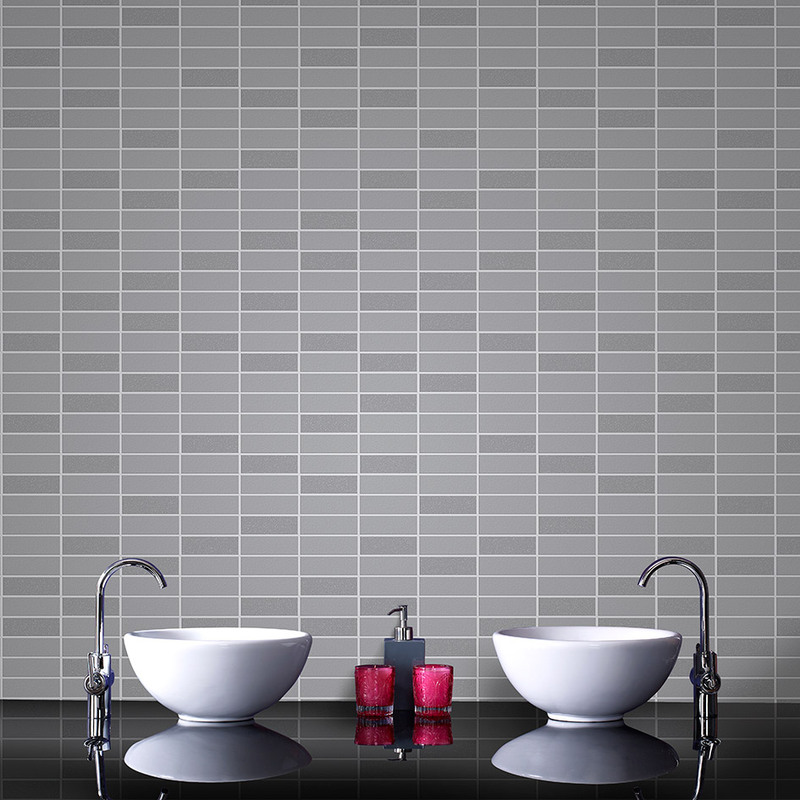 Avoid having to re-grout with this stunning wallpaper that gives the same finish as real tiles. With a subtle change between each grey tile, this interesting pattern brings a sophisticated, clean look to your bathroom.